Are you ready for High Speeds? This tour includes the double Big Daddy Zip Line! Tour time: Approximately 2 ½ – 3 ½ hours long including instruction and gear up time. Times can vary depending on your group size and their fear factor. Total Price: $99 per person. Please Note: Tour INCLUDES the Forest Tour and Flight Pattern Tours. Participants must be at least 10 years old and a minimum of 90 lbs. Max weight of 250 lbs. for women and 285 lbs. for men. The Flight Pattern Plus Zip Line Canopy Tour is just PART of the World’s Largest Zip Line Canopy Tour, and is an amazing Eco Zip Line adrenaline rush! You will experience high-speed zip lines, up to 10 sky bridge walks, three towers, and 14 zip lines, crossing the Lost Gorge five times. This tour features our Big Daddy and IB2 (I’m a Big Daddy Too) high-speed zip lines –both are 1500-feet-long with heights at 200 feet and speeds up to 55 MPH! 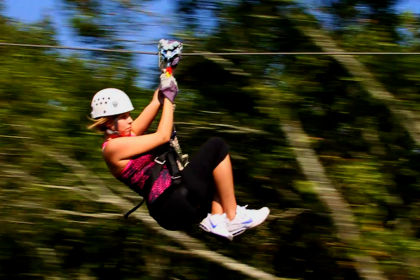 Your tour will conclude with Swoop – our 900-foot long zip line, taking you over and down the middle of Snake Creek! Level 3: participants can add-on our 3400-foot long zip line, the amazing “Flight of the Falcon!” This zip line is one of the longest and most exciting in the world! You can experience the feeling of flight for an additional $49, and experience five additional zip lines and two more sky bridges!